The Jubilee Lodge boasts an impressive collection of amenities within its spacious 26,000 square feet. Boasting views of Mt. 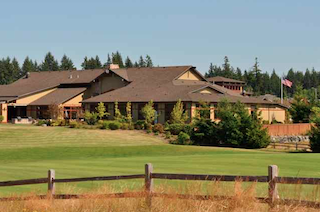 Rainier and the Puget Sound, Jubilee at Hawks Prairie brings the appeal of resort-style living to Lacey, Washington. Active adults who dream of retiring to the Pacific Northwest will feel right at home with this community’s lovely grounds, spacious clubhouse and appealing single-family homes. Resident golfers will particularly enjoy having easy access to the adjacent Golf Club at Hawks Prairie. Jubilee at Hawks Prairie was opened by Jenamar in 2004 and acquired by Shea Homes in 2010. The community is designed to offer both natural beauty and easy access to a variety of local shops, restaurants and other nearby services. Jubilee at Hawks Prairie is conveniently located within a few miles of preserved forests and the Puget Sound, yet it is also just 60 miles from Seattle’s urban attractions. At the heart of the community, Jubilee Lodge invites residents to socialize and pursue a wide range of hobbies and activities. This 26,000 square-foot clubhouse features a spacious community lounge, a large ballroom and a multipurpose activity center. Residents can curl up with a good book in the library, spend time with friends playing billiards or cards in the game room, or let their creativity run wild in the arts and crafts studio. The clubhouse’s large fitness center is outfitted with state-of-the-art cardiovascular and strength-training equipment, as well as an indoor pool and spa area. An elaborate trail system winds throughout the grounds, providing an ideal setting for jogging, hiking or taking a casual stroll. Outdoor recreations also include sports courts for tennis, bocce ball and basketball. Adjacent to the community, The Golf Club at Hawks Prairie offers 36 holes of championship golf where Jubilee residents enjoy reduced fees to play. Golfers can choose from two beautiful 18-hole courses: The Links and The Woodlands. The Links course highlights views of Mt. Rainier and the Puget Sound, while The Woodlands winds throughout old-growth forests. Upon completion, Jubilee at Hawks Prairie will contain about 940 single-family homes. These include 615 resale homes built by Jenamar, as well as resale and new construction residences by Shea Homes. Designs from both builders feature main-level living with open floor plans and luxury touches. The wide range of floor plans throughout the community range in size from about 1,270 to over 2,500 square feet. Homes have a minimum of two bedrooms, two bathrooms and a two-car garage. Most designs also provide a den or third bedroom, and some have larger garages to accommodate three cars or two cars and a golf cart. While many active adults imagine retiring to a tropical beach or arid desert, the Pacific Northwest offers its own picturesque charm. Jubilee at Hawks Prairie combines that scenic beauty with the appeal of resort-style amenities in an active adult community.